As I mentioned a last week, I’m running Windows Vista and Ubuntu on my new laptop. One of the first things I did when I brought my Toshiba A135-4527 home was partition the hard drive and add Kubuntu. I was even surprised to discover that GRUB automatically recognized Vista. This changed the first time I updated Kubuntu, but now I know how to edit GRUB and I’ll never get locked out of Windows again. And the thing is, I really like some things about Ubuntu/Linux. I like that it’s open source. I like that independent developers have come up with just about any program you could ever need, from Open Office for word processing, spreadsheets, and presentations to Audacity and Ardour for simple and complex audio editing, respectively. Although I was a bit wary of giving up CoolEdit, which I’ve been using for audio editing for years, I was seriously thinking about switching to Linux full-time. Sure, it’s a new operating system with a slight learning curve, but Ubuntu makes switching a lot easier than it used to be. And besides, my new notebook comes with Windows Vista preinstalled, so I’d have to learn a new operating system anyway, right? Well, the thing is it’s a lot easier to move from Windows XP to Vista than to Ubuntu. Sure, there are many older programs that aren’t compatible with XP, but most programs designed for Windows don’t run on Linux. You might be able to get some running using WINE, but it’s never the same thing. And there are more fundamental issues. I loaded up Audacity onto my Kubuntu partition with no problem at all. In fact, I didn’t even have to find the Audacity home page and download anything, because the Adept package manager lets you type in the name of the program you want and automatically downloads it for you. Pretty cool. Add “options snd-hda-intel model=3stack” to /etc/modprobe.d/alsa-base. But if you’re coming from Windows, that whole line might not make a lot of sense to you. Anyway, I finally got sound enabled, but now I can’t figure out how to route the sound through my headphone jack without also playing in on my speakers. While this is fine when I’m at home, it could be rather annoying if I want to edit audio or listen to music on the go. I’ve also been entirely unsuccessful in getting Ardour, which is a more full-featured audio editing program to install. Add to that the fact that I haven’t quite figured out how to use RAKI and SynCE to synchronize my Windows Mobile device with Linux. So while I would be totally prepared to use Ubuntu as my primary operating system if all I needed a computer for was some web browsing, office work, and even blogging, as a radio and podcast producer I’m just not ready to make the switch yet. I am planning on keeping Kubuntu installed so I can play with it occasionally. Perhaps as I learn a bit more about how Linux works, I’ll be more comfortable performing essential tasks on it. And maybe one day I’ll make the switch. 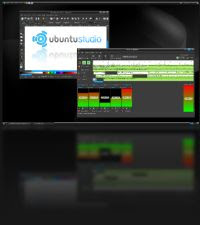 Sometime in the next few weeks, Ubuntu Studio is due out. This will be an Ubuntu-based Linux distribution optimized for audio and video production. Maybe I’ll try installing that when it’s available. But while desktop Linux has come a long way in the last few years, it’s still most suited for power users who know how to solve problems as they arise. Actually, let me amend that. What’s really new about “easy to use” distributions like Ubuntu/Kubuntu 7.04 is that they’re good for power users or novices. If you’re just looking for a basic office suite, some simple games, and a good web browsing/email experience, you could do worse than this free and open source operating system. I tried to go all Linux a couple of years ago however, I ran into similar problems. Now I’m using OS X on my laptop and I couldn’t be happier. I saw this old post accidentally… It is incredible to see how much things have changed in one year concerning Ubuntu and harware support.